BlackGirl.WhiteWine. - Bridal Archives • BlackGirl.WhiteWine. It’s engagement season! And yes, engagement season is a real thing. The period from Thanksgiving to Valentines day is the time of the year when the most engagements occur. I was engaged on Valentines Day 2 years ago so, this time of year holds an extra special place in my heart. I still remember the very first engagement gift we received, two beautiful Diamond Glasses, that we still use to this day. My law school friend gave them to us, and it was such a surprise and felt so special to be celebrated so early into our wedding journey. If your best friend recently got engaged, it’s likely that she hasn’t had the time to set up a registry. Following this engagement gift guide you’ll be sure to get an engagement gift that your best friend will love and actually use. 1. Ring Box: Ring boxes are a popular engagement gift because they work as a beautiful way to store your engagement ring and a wedding day prop. I love the official Mrs. Box because of it’s elegant monogram but I also love this equally beautiful (and much cheaper) Koyal Ring Box as an alternative. 2. Ring Dish: A ring dish is a must have for any bride to be. It’s the perfect place to put your ring while while your not wearing it. There are TONS of cute ring dishes out there, but this Heart Ring Dish was one of my favorites. 3. Diamond Glasses: As I mentioned, Diamond Glasses were our first engagement gift. They’re such beautiful glasses and paired with a bottle of alcohol makes a great engagement gift. 4. Personalized Door Mat: A personalized door mat is one of my favorite things on this list. Etsy has tons of options but I love this Personalized Door Mat because of the option to include a wedding year. 5. Alexa: She can give you reminders, tell you when your packages get delivered, and can even make phone calls for you. Alexa is almost as good as a real life personal assistant. While she’s one of the more expensive gifts on this list Alexa is totally worth it in my opinion. 6. 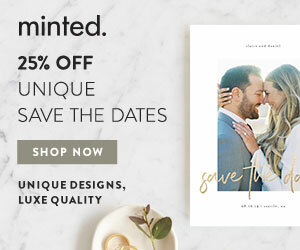 Personalized Stamp: New couples will be sending a lot of mail in their near future; save the dates, invites, thank you notes and more. This Personalized Stamp is a cute gift that they’ll be sure to get a lot of use out of. 8. Future Mrs. Wedding Planner: Every bride needs a planner to keep track of important dates, documents, and notes. I really love this Future Mrs. Wedding Planner because it’s creators have thought of EVERYTHING. It has a section for all the important wedding details and even comes with bridesmaid proposal stickers. 9. Champagne Bears: I love love love an edible gift. Sugarfina has so many sweet treats to give to the couple to be, including these Celebratory Champagne Bears and this Pop The Champagne Set. 10. Engagement Announcement Mug: If you don’t have an Instagram picture with one of these Engagement Announcement Mugs, did you really get engaged?? Get your best friend this mug so she can take her obligatory picture and drink some coffee when she’s done. Let me know what you think of my picks, and if there is anything on my list that you’d love to give or receive as an engagement gift!